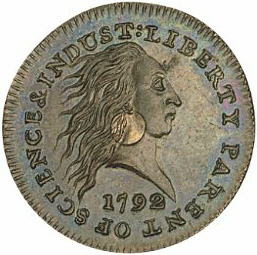 1792 saw a flurry of activity aimed at establishing a Mint in America. Congress passed a Mint Act, chose a Director, purchased a plot of land, erected a building, and hired employees. Four prototypes of the One Cent piece were tested: a large copper piece (the "Birch" Cent), a smaller copper piece with a silver center (the Silver-Center Cent"), another of the same size (the Fusion Alloy Cent, in which the silver and copper were melted together), and another of the same size in pure copper. The Silver-Center Cent answered the concerns of then Treasury Secretary, Alexander Hamilton, who felt that a billon coin could be too easily counterfeited. However, the technical difficulties in producing quantities of the Silver-Center Cent remained. 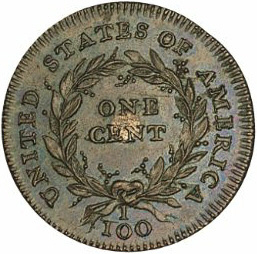 Although no written evidence remains to record the testing, clearly the large, pure copper piece was favored, as this was the chosen format when production of Large Cents began in 1793. When Frank Stewart demolished the original Mint building circa 1924, he discovered some blank planchets for the Silver-Center Cents (missing the silver center). In 1994, Anthony Terranova discovered a struck Silver-Center Cent missing the silver center. The several experts who examined this piece believe that the silver center was never included and that the coin may have been a test piece to show the size of the new coin. Judd considered all the plain edge pieces to be counterfeits. Credit for the design and engraving of the Silver-Center Cent normally goes to Henry Voigt, the first Chief Coiner of the U.S. Mint, however this assignment is subject to interpretation and is probably incorrect. The engraving skills shown on the Silver-Center Cent exceed those possessed by someone with no previous engraving experience.